Just yesterday, we got a pretty close look at the Galaxy S10+. The device looks quite identical to some of the recent Galaxy devices, except some minor design changes. And now, the folks at WinFuture have leaked a whole array of official renders for both the Galaxy S10 and S10+, revealing the devices in all their glory. Both the devices come in a regular black finish, as well as a new Prism White colourway and a green colourway. Both the devices are incredibly identical, except the notch design. While the regular Galaxy S10 comes with a 6.1-inch display, the S10+ features a 6.4-inch panel. The S10+ also has a dual front camera, making the Infinity-O notch flatter than the regular Infinity-O notch on the regular S10. Both the devices also lack a fingerprint scanner, meaning they will come with an integrated fingerprint sensor on the display. So far, we also know that Samsung is opting for the Snapdragon 855 to power the devices, and it will come with at least 6GB of RAM. The company is also expected to cheaper Galaxy S10 variant, likely called the S10e, though details on that have not been revealed yet. It will likely compete with Apple’s iPhone Xr. Samsung is expected to reveal its new Galaxy S10 line, along with its new foldable phone, on February 20. A leaked promotional image may have just given us our first look at Samsung’s rumored upcoming true wireless earbuds. 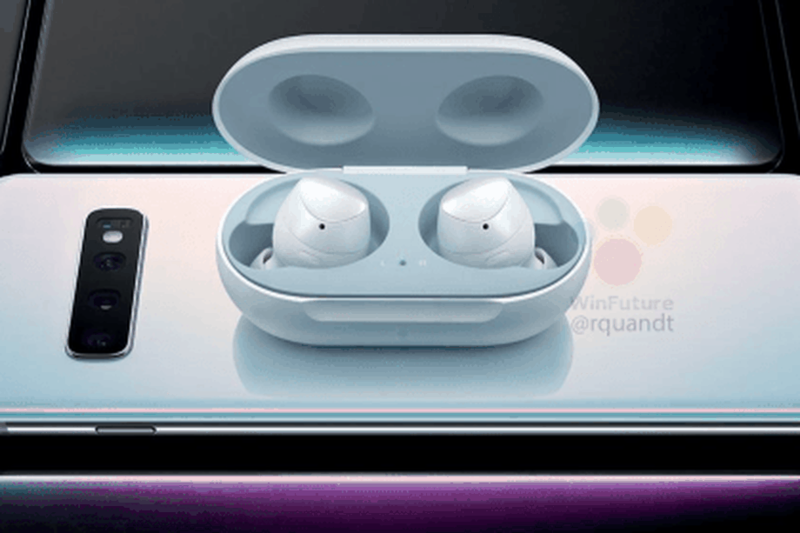 In the images posted by WinFuture, the “Galaxy Buds” (as a trademark application and Bluetooth certification suggest they’ll be called) can be seen sitting on the rear of what appears to be a Galaxy S10 handset. This positioning might not be a coincidence. According to an earlier rumor from SamMobile,the unannounced S10 will be able to wirelessly charge other devices using a technology called “PowerShare.” It’s a similar feature to what we saw with the Huawei Mate 20 Pro and its FreeBuds 2 Pro Wireless earphones. Much as the Galaxy Watch wasn’t Samsung’s first smartwatch, the Galaxy Buds won’t be its first true wireless earbuds (hello 2016’s Gear IconX). Instead, they’re another step toward unifying much of the company’s lineup under the Galaxy brand, and away from the Gear branding of yesteryear. At least the Gear VR isn’t going anywhere… right, guys? A ton of Samsung Galaxy S10e images have just surfaced, both renders and real-life images. The main takeaway from all this is the confirmation of a side-facing fingerprint scanner. Truth be said, these images are still leaks, so it’s not exactly an official confirmation, but the renders shared by Roland Quandt are usually spot on, so chances are that the provided renders are official, and thus legit. This is not the first time the Galaxy S10e’s design surfaced, but the provided images do give us the best look at the device yet. The Galaxy S10e will resemble its siblings quite a bit, but unlike all the other Galaxy S10 phones, it will sport a flat display, which is noticeable in the provided images. This is also the only Galaxy S10-branded phone which will ship with two rear-facing cameras. On top of all that, the Galaxy S10e will also be smaller than all the other Galaxy S10 phones. This phone’s size is actually one of the reasons its side-facing power / lock key aka fingerprint scanner is placed so high. The Galaxy S10e will include a 5.8-inch display, compared to 6.1 and 6.4-inch panels on the Galaxy S10 and S10+, so it will be noticeably smaller. The Galaxy S10e is actually expected to be a bit smaller than the Galaxy S9, so if you’re looking for a one-handed Galaxy S10 device, this will be your best bet. The phone’s display will be rounded on the sides, while its selfie camera will sit in the top-right corner of the display. A thin “chin” is a part of this design as well, and there are three physical keys included on the left-hand side of this phone, the volume up, volume down, and Bixby buttons. Samsung is still pushing that infamous Bixby button, and it seems like it doesn’t plan to stop anytime soon. The back side of the Galaxy S10e is curved on the sides, and as you can see, its cameras are horizontally-aligned, while an LED flash is located next to them, along with an additional sensor, quite probably a heart-rate sensor. In the gallery down below, you will be able to check out the Galaxy S10e in various colors, including Prism Black, Prism Green, and Pearl White. Do keep in mind that a Canary Yellow variant is also expected to launch on February 20, but not a single image of that model is not included. The Galaxy S10e will feature a 5.8-inch Super AMOLED display, and chances are Samsung will include a fullHD+ panel in this phone, instead of a QHD+ one, but we’ll see. The phone will be fueled by the Exynos 9820 in Europe and India, while the Snapdragon 855 will fuel it in the US and China. The Galaxy S10e will sport 6GB of RAM and 128GB of storage, while a 3,100mAh battery will also be a part of the package. Android 9 Pie will come pre-installed on the phone, along with Samsung’s One UI overlay. The device will become official on February 20, along with the Galaxy S10 and Galaxy S10+, while it is rumored to cost €749 in Europe. Android Q news is starting to arrive bit by bit, largely due to an early AOSP build that's been doing the rounds. Probably the most welcome enhancement — other than the much-anticipated system-wide dark mode — is an overhaul to the privacy and permissions settings. We already learned that the next big version update could prevent background apps from reading your clipboard, although background location access could return. It's okay though, as you'll be notified by a status bar icon if an app is using your location, camera, or microphone. Clicking on the icons will also bring up a dialog. Additionally, you'll be reminded with a notification that you've granted always-on access to an app for location services. Android Q is also getting a brand-new permission called 'Financial Apps SMS Access' for banking transactions. A new UI on each individual permissions page stands to make it easier to see which apps are allowed to use it and which have had access denied. Right now it's a long list with different toggles. There's also a new subpage for each entry with some additional usage information, which could come in very handy. Detailed permissions usage is presented with pretty bar charts and generally nicely laid out. When running legacy apps (those that target an API level below 23), Android Q will ask you to approve or deny all relevant permissions the first time you start them. A new feature called 'Roles' was touched upon in XDA's recent hands-on video. It looks to be a replacement for the 'Default apps' options, but there's a bit more to it than that. There are hints that suggest the service will be able to allow certain permissions based on which role it's assigned, which will allow users to give roles to certain apps and not worry about granting associated permissions. When you sideload an app in Pie, the package installer will pop-up with a full-screen UI to ask if you are sure you want to install. That's changing to a smaller, central dialog that doesn't waste so much space as before. 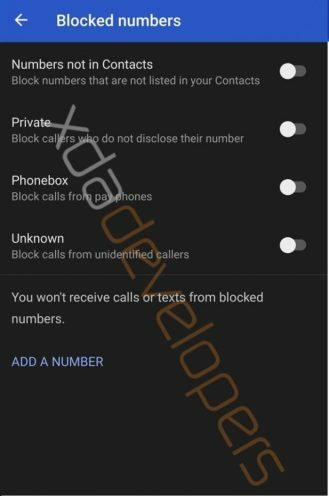 In a move that will be welcomed by anyone who deals with multiple spam calls per day, the AOSP dialer app in Q lets you block numbers that are unknown, private, pay phone, or just not in your contact list. 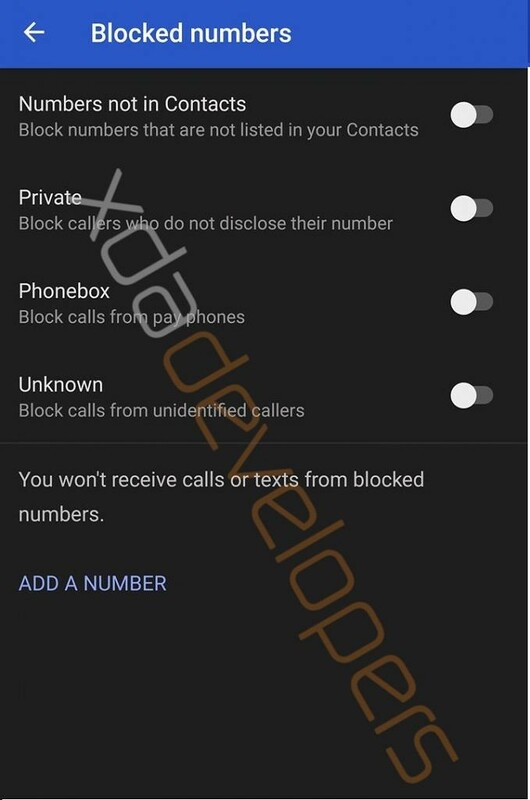 The Google Phone dialer is expected to get this too. Finally, it's been noted that every installed app now shows up in the AOSP launcher's app drawer, although this may well be a bug — time will tell. The Samsung Galaxy S10 rumors and leaks are constantly coming in, and the latest leak actually shows off both the Galaxy S10 and S10+ in live photos. If you take a look at the gallery down below, you will be able to see both devices in fairly clear images, from both the front and the back, so there’s very little to hide when it comes to the design of these two smartphones. These images come from Twitter, and there’s a good chance they’re legit. As you can see, in the provided images, the only difference between these two phones in terms of the design lies on the front, in their front-facing cameras. The Galaxy S10 includes a single camera in the top-right corner of its display, while the Galaxy S10+ comes with two selfie cameras which are placed in the same spot. Both devices sport three cameras on the back, and those three cameras will be completely identical on both phones. Now, if you take a look at the picture that shows the front side of the Galaxy S10+, you will be able to see the fingerprint scanning icon on the lock screen, which is more or less a confirmation that the phone will include an in-display fingerprint scanner, even though that was quite obvious thus far. Both the Galaxy S10 and S10+ will include an in-display fingerprint scanner, while the Galaxy S10e will be the only Galaxy S10-branded phone not to include such a sensor, it will ship with a side-facing fingerprint scanner. The Prism Black Galaxy S10 is shown in the provided images, while the Pearl White Galaxy S10+ accompanies it. Both phones are made out of metal and glass, and both sport curved displays. The Galaxy S10 will include, according to rumors, a 6.1-inch QHD+ Super AMOLED, curved display, while the Galaxy S10+ will ship with a 6.4-inch QHD+ Super AMOLED, curved display. If you take a closer look at the provided images, you will be able to notice that a power / lock key is located on the right-hand side of both phones, while the Bixby, volume up, and volume down buttons are included on the left. Both phones include a really thin “chin” below the display, and both come with Samsung’s branding on the back. One interesting thing about the design of these phones is the position of the power / lock key, as it’s placed high-up on both phones, for the Galaxy S10 it makes more sense as it’s a bit smaller than the S10+, but it just seems to be placed too high on the Galaxy S10+... at least it seems like it based on these, and all the other images that leaked, but we’ll see what will it feel like once the two devices become official. Samsung had scheduled its Unpacked event for February 20 in San Francisco, and it’s pretty obvious that the Galaxy S10 series will be announced at the event, hence debuting even earlier in the year than most of its predecessors did. Samsung is planning to announce the Galaxy S10e, S10, and S10+ handsets there, and a top-of-the-line variant of the Galaxy S10+ will include a ceramic backplate, 5G support, and more RAM than all the other Galaxy S10 models, as it is rumored to ship with 12GB of RAM. The Galaxy S10e will be the most affordable variant of the Galaxy S10, and it will be the only Galaxy S10-branded device to ship with a flat display, two rear-facing cameras, and a side-facing fingerprint scanner. The Galaxy S10e will also have the smallest display out of the bunch, as it will include a 5.8-inch fullHD+ or QHD+ panel. It's a complicated subject, but the short version is that up until now customers on RCS-compatible carriers have been limited to using just a few apps if they want RCS' features. Google partnered with a whole pile of OEMs, including LG, Motorola, Sony, HTC, HMD Global/Nokia and many others to use Android Messages for RCS, and Samsung's stock messaging app also supports RCS — though each of the two solutions only works on some carriers. In the future, you may not have to limit yourself to specific apps to get RCS' features, though. Based on a pile of commits on the AOSP Gerrit, a whole new set of RCS-specific APIs are being opened up for a future Android release, almost assuredly Q. Changes cover a new CTS package to renaming and revealing a bunch of existing APIs. If changes like these are integrated into Android, it means any messaging app willing to put in a bit of effort can support RCS — at least, if your carrier supports the right set of standards. With Messages supporting Jibe right now, presumably third-party apps will at least gain support for that. That could mean you won't have to give up all the functionality of your favorite third-party messaging app just to use RCS. Thanks to the carriers, RCS may still be a mess for the average consumer, but Android Q and 2019 might make things a whole lot easier. The postings are quite clear in regards to the importance of Google's wearable projects as they directly state the two future hires in question are meant to be on close working terms with the hardware unit's senior leadership as they come up with ways to create new and improve existing products. Not only is this a strong indication that some kind of Wear OS gadgets are already in the works but also suggests Google isn't just looking to test the waters with a single watch but is planning its wearable push on a much broader scale. The development is in line with last year's rumors about a Pixel-branded lineup of smartwatches being in development as Alphabet's subsidiary was supposedly preparing no fewer than three distinct models. The devices were reportedly meant to be released by the end of 2018 and while that didn't happen for unknown reasons, a Google smartwatch is still something many industry watchers expect will hit the store shelves in the near future. Last month, Google paid tens of millions of dollars for wearable technology created by American electronics maker and fashion company Fossil. The surprise deal was announced without many details, with the duo only confirming the transaction also saw some Fossil engineers in charge of supporting the tech in question move to Google. The mysterious tech may not be hardware-dependent and consequently doesn't necessarily imply a Pixel smartwatch being in the works, though that's precisely the conclusion reached by many analysts in response to the deal's announcement. Besides yet another layer of portfolio diversification, a first-party smartwatch could make sense for Google by fulfilling a role similar to that of the now-discontinued Nexus range of Android smartphones, i.e. serve as a reference point for manufacturers interested in leveraging the firm's software in order to create a premium (wearable) user experience. The Pixel series demonstrated that Google's hardware and advertising dominance doesn't necessarily translate into optimal hardware sales; in terms of wearables, the company's only product to date comes in the form of the Pixel Buds, wireless headphones which received a lukewarm response from consumers and critics. Besides smartwatches, Google may also dabble into mid-range Android smartphones later this year as recent rumors suggested the Pixel 3 Lite and Pixel 3 XL Lite are in the works. The Samsung Galaxy S10e has been leaking for a while, but until now, we did not see the Canary Yellow variant of the device. That changes today but as evidenced by the newly leaked images below, this is quite probably the most eye-popping variant of the phone, for better or worse. Other than the color difference, this phone is pretty much identical to all other Galaxy S10e variants that we’ve seen to this point. The Galaxy S10e will be quite similar to other Galaxy S10 units, but with a couple of differences. This will be the only phone to sport two cameras on the back, and a side-facing fingerprint scanner, as its fingerprint scanner will be located on the right, and will double as a power / lock key. In addition to that, this will be the only Galaxy S10 handset to sport a flat display, not to mention that its display will be smaller than all the others, as it will measure 5.8 inches. We’re still not sure if Samsung plans to include a fullHD+ or QHD+ panel in the Galaxy S10e, but you can expect to see a Super AMOLED display here, that’s for sure. The Galaxy S10e will be made out of metal and glass, and that goes for both the Galaxy S10 and S10+ as well, but the top-of-the-line Galaxy S10+ is a different story, as it will include a ceramic backplate, more on that later. The Galaxy S10e will include an extremely thin “chin” below the display, and its front-facing camera will be located in the display, in the top-right corner of the display, to be accurate. The volume up, volume down, and Bixby buttons will sit on the left-hand side of this phone. Now, in addition to releasing these renders of the Canary Yellow Galaxy S10e, the source also shared dimensions for all three Galaxy S10 handsets. The Galaxy S10e will measure 142.5 x 70.5 x 8.1mm, the Galaxy S10 will be a bit larger at 149.9 x 71.6 x 8.1mm, while the Galaxy S10+ will be a considerable increase in size, as it will measure 157 x 75.3 x 8.1mm. As you can see, all three phones will be equally thick, which is interesting. The Galaxy S10 and S10+ will essentially look the same on the back, while there will be a single difference with them on the front, the Galaxy S10 will include a single selfie camera, while the Galaxy S10+ will ship with two. The top-of-the-line Galaxy S10+ unit will look the same as the regular Galaxy S10+, but it will ship with a ceramic backplate, instead of glass, and it will include 5G support, and 12GB of RAM on the inside. The Galaxy S10 and S10+ will ship with 6.1 and 6.4-inch QHD+ Super AMOLED, curved displays, and in-display fingerprint scanners. Android 9 Pie will come pre-installed on all Galaxy S10 units, with Samsung’s One UI overlay on top of it. All Galaxy S10 variants will be fueled by the Exynos 9820 or Snapdragon 855 SoCs, depending on the market you buy the phone in, as the Exynos 9820-powered units will ship to India and Europe, while the Snapdragon 855-powered variants will be available in the US and China. Samsung has largely given up on trying to keep a lid on Galaxy S10 leaks, assuming the company isn't responsible for many of them in the first place. The latest premature information about the upcoming Android flagship lineup comes from international retailer Mobile Fun and is based on third-party protective cases for the Galaxy S10 series manufactured by a company called Olixar. The newly unveiled gadgets confirm numerous previous rumors about the high-end product family, including its selection of ports and physical buttons. There are virtually no surprises on that front as all Galaxy S10 models will be pretty much identical to the last two generations of Samsung's flagships. In other words, expect a USB Type-C connector, 3.5mm headphone jack, a compact power button on the right, volume rocker on the left, and a dedicated Bixby key sitting immediately below audio controls. The only possible change in this regard comes in the form of volume controls on the Galaxy S10+ as that particular model appears to be featuring separate volume-up and volume-down keys, whereas the other two variants sport a seesaw-shaped button. Key placement is also similar to last year's models, though the largest variant once again goes against the grain by having the power key positioned slightly higher. This design choice is a curious one seeing how the phablet already appears to be massive and the new power button position is bound to make reaching it even more difficult. All of the devices are ditching the rear-mounted fingerprint sensor that's been a staple of all Samsung-made handsets in the premium price bracket since 2017. In its place comes an in-display reader integrated inside the Galaxy S10 and Galaxy S10+, whereas the "entry-level" Galaxy S10e will feature a scanner that will double as a power key à la contemporary Sony Xperia handsets. The newly leaked Olixar Sentinel case supports that possibility as it's the only gadget which doesn't cover the power key slot. In terms of mobile photography, the Galaxy S10e should debut with a horizontally arranged dual-camera setup on the back, whereas the other two models are expected to sport one extra rear-facing lens, according to a broad range of previous reports, sightings, and the cases at hand. The dimensions of Olixar's latest cases indicate the Galaxy S10e will use a 5.8-inch display which will be entirely flat, a first for a Samsung-made flagship since the Galaxy S7 released three years ago. The Galaxy S10 and Galaxy S10+ should in turn have 6.1- and 6.4-inch screens, respectively. The screen protectors accompanying the cases also dismiss the possibility of display notches being part of any single package Samsung intends to announce this month; virtually all industry insiders agree the company will instead be turning to its new Infinity-O panels, Super AMOLED modules with holes for front-facing cameras. The Galaxy S10e and Galaxy S10 will feature one such sensor, whereas the Galaxy S10+ will have two of them, according to a plethora of sources. Samsung's next high-end range of Android phablets is scheduled to be officially announced on February 20 and should become available for purchase in the first half of March. The Galaxy S10 has had its privacy violated once more. After months of persistent leaks and rumors, a mortifyingly comprehensive list of specs for each of Samsung's forthcoming flagship phones has now been published, according to GSM Arena. The spec sheet, which is said to have come from a source inside of Samsung's "retail channel," uses the phone's rumored code names -- Beyond0, Beyond1 and Beyond2 -- which we now believe to be the Galaxy S10 Essential, Galaxy S10 and Galaxy S10 Plus, respectively. The documents largely corroborate features already confirmed by Samsung or previously reported, though there some minor details that GSM Arena claims are new: 800-nit displays across the lineup plus a 6.3-inch display and 3,040x1,440-pixel resolution for the S10 Plus model. Also included are the official colors: prism white, prism green, prism black, luxurious ceramic black, luxurious ceramic white and canary yellow. Samsung did not immediately respond to CNET's request for a comment. In the midst of this voluminous leaking, Samsung has attempted to manufacture some suspense for its upcoming Unpacked event by promoting its foldable phone -- possibly called the Galaxy X, Galaxy Fold, Galaxy Flex or Galaxy F -- which it says it will also show off on Feb. 20. It looks pretty much like the G7 ThinQ. We might see LG's G7 ThinQ successor in a little over a week -- so naturally, leaks have already started pouring out of the company and onto the internet. One of those leaks is a group of images showing the upcoming G8 ThinQ from every angle, and based on those photos, the flagship phone will bear a strong resemblance to its older sibling. It's also an all-screen device with a notch for the front camera, though it looks like its rear ones have been rearranged into a horizontal format. You'll see the usual ports in the photo of its bottom part, including a 3.5mm jack that a lot of other phonemakers have chosen to ditch. While the company has yet to release the flagship's specs, it did reveal earlier this month that it's equipping the device with a "Time of Flight" image sensor made by Infineon. The technology will apparently power the phone's facial recognition and AR capabilities and will allow you to take better selfies in all kinds of lighting condition while using less power than Apple's FaceID. A previous rumor suggested that one of LG's upcoming devices will support a second screen. While these images don't show anything like that, that second screen is supposed to be an attachment and not a part of the phone itself. Another previous leak puts the G8 ThinQ's price at below $1,000. You might not have to wait that long to know if either of those are true -- LG is expected to launch its next flagship at a special pre-Mobile World Congress event on February 24th. After Android users explained their reasons for a secret envy of iPhones, Apple users returned the compliment. Deep inside, though, they're full of the same insecurities as anyone else. I judge this from a Reddit thread in which iPhone users confessed to the things they think Android phones do better. Yesterday, I presented the remarkably open feelings of Android users as to their phones' inferiorities when compared to iPhones. The Redditor who asked for these feelings, handle u/guyaneseboi23, posed a similar question to iPhone users. The answers rolled in. Some of them were painful. Hey, Siri. iPhone users still think you're about as useful as a pencil in a darts competition. "Google Assistant just crushes it," said one. I rather agree. In my household, my wife's Google Assistant makes my Siri look like, well, me compared to my wife. One iPhone user did say they didn't find Siri a problem: "I keep her off." And then there are notifications. On the newest iPhones, they are covered up. You have to unmask your screen to discover if anyone has messaged you or is merely pestering you. "I like having the icons on top in Android. It's easy to forget if I open the iPhone and then lock it," said one iPhone user. Another, though, contended the true issue here was customization: "The beauty of Android is that you can have the icons there if you want, or remove them. The only downside to iOS is the lack of customization." Organization of apps also frustrates some iPhone users. One explained: "I wish more than anything I could just control my app grid. I find the mess of icons to be the most frustrating thing about the iPhone and I really wish there was an app drawer or at the least the ability to put apps where I want." Another put it more emotionally: "I just want to see my kids on my wallpaper vs their faces covered by icons. It's 2019 for f sake." Android phones, say these confessors, also have better WiFi calling, the ability to set monthly data usage allowance in settings and a far easier way to search text messages. And then there's multitasking. Those Androiders are adroit at doing two things at once. The iPhone would rather you just focus on one thing, so doesn't offer split screen. Some bemoaned the iPhone's alarm was inconsistent. "I've had flip phones with more reliable alarms," said one. Others were desperate for Dark Mode and T9 (predictive text) calling. Even here, though, there were those so committed to the Apple brand that they couldn't -- or wouldn't -- offer anything that Android does better. One commented: "Nothing. If there was something, I'd rather considered [sic] buying an android." Android Pie may still be rolling out, but already we’re looking ahead to Android Q — and it could represent some significant changes to Android as a whole. While we have absolutely no idea what Android Q will be called, we do have an idea of what it may offer, thanks to rumors and leaks that have started popping up. We’ve already talked about Face ID support in Android Q, so we won’t elaborate on it again. Suffice to say, more Android vendors may come with 3D facial recognition in the future if this feature ends up in Android Q. It turns out any app can access the contents of the clipboard, without requiring any permissions, which means sensitive data is potentially at risk. Android Q will fix that by limiting what apps can read the clipboard in the background. Ever wished you could undo an app upgrade to, say, prevent Slack’s icon from changing? Well, Android Q will let you roll back time on those updates, and revert to a previous app version. Android Q will also come with a new way of securing files on microSD cards, to prevent third-party apps from harvesting personal data that might be stored on external storage. Apps won’t be able to access any photos and videos, or the location data for your images. Access to music files will also be blocked. Google will have a new permission in place that allows an app in the background to have access to a user’s location, a feature some Android users may want for various location-tracking purposes. Android Q will automatically recognize when you’re working out or doing any physical activity. This permission already existed in Google Play Services, but it looks like it’ll be added to the core Android features. Android Q will come with a system-level screen recording menu that will let you record video on your screen. An “ongoing notification” will be present at the top of the screen allowing users to start, stop, and share the video. Users will also be able to record voiceover for the clip they record as well. Press the power menu in Android Q, and you’ll be able to access the Emergency button. Hopefully you’ll never have to utilize this feature, but it’ll be a faster way to access emergency services. There’s a Sensor Privacy option in the Quick Settings menu that will let you disable some of the sensors, in case you’re worried about the kind of data the built-in sensors can collect. Something called a privacy chip might appear at the bottom of the screen to tell users if an app is recording data, whether it’s location, voice, or something else, and possibly offer shortcuts to stop that behavior. Android Q is also expected to deliver a new notification management menu that could include the option to Block notifications, which would replace the current Stop notifications. Options to Show silently and to hide or show low-priority notifications may also be included in the menu. WPA3 support is coming to Android — a feature that was announced last summer. The first 5G phones are hitting stores this year, so expect to see 5G and 5G+ symbols in Android Q. The time in this leaked build of APK is 10:10, a hint that Android Q will be Android 10 (not that we really expected anything different). An update to Samsung’s wearables app has inadvertently revealed an entire lineup of new products that are presumably set to be unveiled alongside the Galaxy S10 next week. The Galaxy Wearable app for Android, formerly known as Samsung Gear, now displays several new products on the front page including wireless earbuds, a smartwatch, and a fitness band. The update was spotted by Twitter account SamCentralTech. The Galaxy Watch Active is first on the list, and looks to be the same sports-focused smartwatch that recently leaked under the supposed name Galaxy Sport. It has a 40mm case, according to the app, and comes in at least two colors. Nothing about the new head-on image gives any further clues about how Samsung might replace its traditional rotating-bezel UI, however. 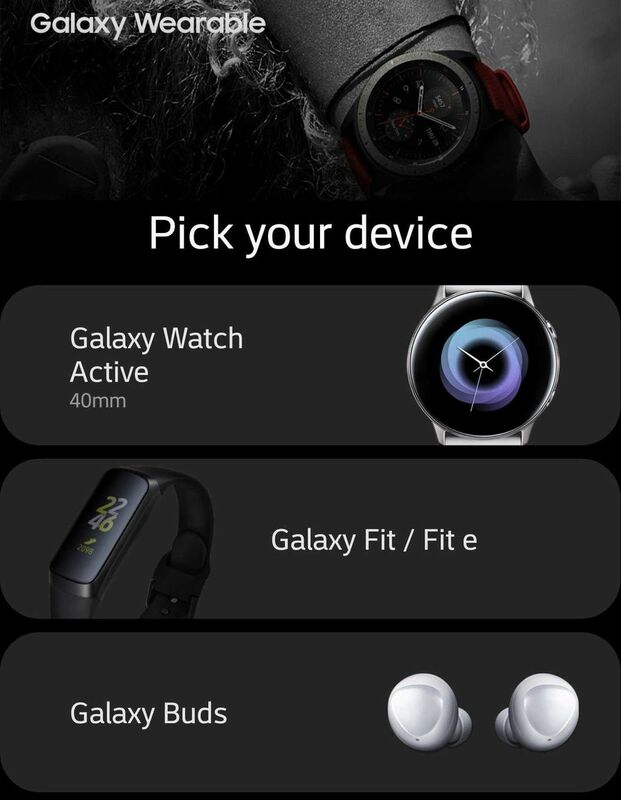 Next is the Galaxy Fit and Galaxy Fit e, two fitness bands with watch-style rubber straps. 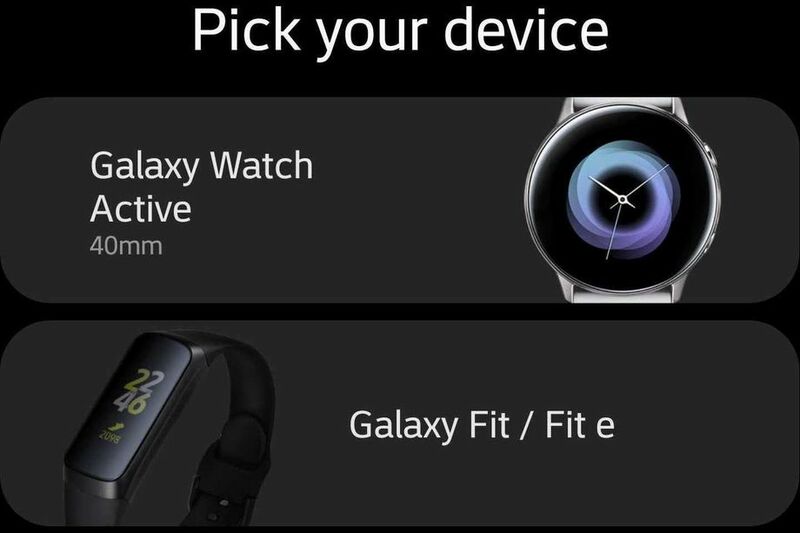 The “Galaxy Fit e” name leaked through a Bluetooth certification last month, but this is the first time we’re seeing the product. It’s not clear what the “e” signifies, though, or how the non-e model will differ. Finally, we have official confirmation of the Galaxy Buds, Samsung’s new wireless earbuds. Those have leaked a couple of times already, and are said to be able to charge wirelessly from the Galaxy S10 itself. Top-of-the-line variant of the Samsung Galaxy S10+ has now surfaced on both AnTuTu and Geekbench. Both of those listings share some spec information when it comes to this phone, while we also get to see its benchmark scores on both fronts, and it surfaced with a “SM-G975F” model number. Starting with AnTuTu, the device managed to score 326,185 points, which is actually quite close to the score that a 6GB RAM variant of the phone was able to provide, and it’s one of the best scores on AnTuTu to date. AnTuTu also confirms that the phone will ship with Android 9 Pie, 12GB of RAM and 1TB of storage. The display resolution provided by AnTuTu seems to be completely off, though, as the listing says that the phone will ship with a fullHD+ (2280 x 1080) display, while it will almost certainly include a QHD+ (3040 x 1440) display. It is also worth saying that this is the Exynos variant of the phone, so it’s fueled by the Exynos 9820. Geekbench listing also reconfirms Android 9, 12GB of RAM, and the Exynos 9820. The phone was able to hit 4,450 points in the single-core benchmark on Geekbench, while it scored 9,753 points in the multi-core benchmark. This listing also reveals that the phone’s processor will be clocked at 2.0GHz. The Samsung Galaxy S10+ is said to arrive in three different variants, including 6GB, 8GB, and 12GB of RAM options. Those three variants will ship with 128GB, 512GB, and 1TB of storage, leaks say. The most powerful variant of the Galaxy S10+, the one that got benchmarked, will include a ceramic backplate, unlike all other variants, while it is also rumored to ship with 5G support. Other than that, and the difference in RAM and storage departments, it will be identical to other models. The Galaxy S10+ will reportedly feature a 6.4-inch QHD+ (3040 x 1440) AMOLED display, which will be curved, and the phone will also include an in-display fingerprint scanner. One 16-megapixel and two 12-megapixel cameras will be included on the back of the device, while you will be able to find 10 and 8-megapixel cameras on its front side. The Galaxy S10+ is said to ship with a 4,100mAh non-removable battery, and both Ceramic Black and Ceramic White versions have leaked thus far. The device will ship with Android 9 Pie out of the box, with Samsung’s One UI overlay on top of it, like every other Galaxy S10 model. The Galaxy S10+ is rumored to weigh 175 grams, though the ceramic variant of the device will be a bit heavier than that. Samsung will introduce its Galaxy S10 series of smartphones on February 20 in San Francisco, and other than the Galaxy S10+, the company will also announce the Galaxy S10e and S10. The Galaxy S10e will be the cheapest, and smallest Galaxy S10 handset, while the Galaxy S10 will be quite similar to the Galaxy S10+, at least according to a ton of rumors and leaks that surfaced in the last couple of weeks. It all started as a wild rumor a few months ago. Samsung would launch a Galaxy S10+ version with 12GB of RAM and 1TB of storage, specs that no other Android phone can match right now. But more and more confirmations started coming in, as we got closer to Samsung’s Unpacked press conference. We saw a couple of price leaks from Europe, listing all Galaxy S10 versions including the 12GB/1TB model, as well as a benchmark leak in the past few weeks. The model would be significantly more expensive than other Galaxy S10 versions, those leaks said, and now we have a price leak from China that tells the same story. According to the image, the handset will be priced at 10,000 yuan ($1,47 , which is in line with previous price leaks. The same screenshot says the Galaxy S10+ with 8GB of RAM and 512GB of flash memory will cost 9,000 yuan ($1,330). The prices are almost in line with the European prices that leaked a few weeks ago, although the EU prices were even higher. Prices will differ from market to market, as smartphone vendors have to factor in currency conversions and tax for many markets. But even so, the picture is pretty clear. You should be ready to drop extra cash if you want to buy the only phone in the world sporting 12GB of RAM and 1TB of built-in storage. As with previous Galaxy S launches, Samsung will surely offer you various perks for preordering the phone as early as possible, with a recent rumor saying that the new Galaxy Buds wireless earphones will be offered for free during preorders. Also, Samsung already kicked off a reservation system for the phone, and you’ll save more money if you trade-in your older handset. All will be revealed later this week when Samsung unveils the Galaxy S10 series in San Francisco. Preorders are likely to start soon after the show, with in-store sales set for March 8th, according to recent reports. Whether you like it or not, Android 9 Pie does introduce gestures to Android. Some find them to be lacking compared to the gestures offered on the 2018 Apple iPhone models and the iPhone X, but other Android users are satisfied. You might recall that when using the Android 9 gestures, the back button comes and goes. If it is possible for the user to go back a page, the button appears. Otherwise, it is not there. Many of the complaints about the gesture controls in Android 9 deal with the back button and swipe up from the "pill" to open the app drawer. However, a pre-release version of Android Q obtained by XDA reveals that in the next build of Android, the back button could be removed and replaced by a gesture that requires the user to swipe the "pill" to the left to go back. Another change will allow users with an open app on the screen to swipe the "pill" to the right to view the previously active app. If one were to continue sliding the pill to the right, he will see his remaining open apps. Sliding on the "pill" while in the app launcher will allow users to run through all of their apps. Tap pill to go "Home"
Of course, by the time Google unveils Android Q during Google I/O (May 7th-May 9th, 2019), the gesture controls could be changed again. Tomorrow, Samsung is set to officially unveil a plethora of new products, and the company hasn’t done the greatest job in hiding those secrets. We’ve already seen tons of leaks of Samsung’s Galaxy S10 family, as well as its new watch and headphones. In the latest leak, though, the Samsung Galaxy Watch Active and Galaxy Buds get pictured from all angles and leave nothing to the imagination. Courtesy of the folks over at WinFuture, the Samsung Galaxy Watch, in particular, has basically nothing to hide at this point thanks to this leak. The new smartwatch gets pictured from every angle in all four colors – Black, Silver, Blue, and Rose Gold. There’s not much new to gather from these images, but we can see that Samsung is using the same heart rate sensor from the standard Galaxy Watch, and just like that watch there are only two physical buttons. Given the proportions at play, I’d also speculate that the Galaxy Watch Active uses a 20mm connection for straps instead of the 22mm found on its big brother. In a further gallery of images, we get another big leak of the Samsung Galaxy Buds. The company’s new truly wireless earbuds have a design that’s still very similar to what came before, but there are a few new changes we can see in these images. For one, the power connection is still a pin, but it’s only two instead of four like the Gear IconX. It seems like they might be easier to align. Also, there’s the vivid Canary Yellow color variant that seems to be aimed at matching the Galaxy S10e variant of the same shade. It’s not my cup of tea, but if you want your earbuds to stand out, this is definitely one way to do it. Now that virtually every feature, design detail and specification of the Galaxy S10 line has leaked, it would seem that there wouldn’t be anything else to discuss until Samsung officially unveils the phones on Wednesday. But the internet never rests, and over the past few days, two prolific leakers have shared high-quality images of several accessories for the S10, such as cases and screen protectors that will likely launch alongside the phones. The image atop this article, which comes courtesy of Roland Quandt, shows off the LED Cover for the Galaxy S10e (which is expected to be the cheapest and lowest-specced of the three Galaxy S10 models). It apparently features an “Emotional LED Lighting Effect,” which results in the patterns and notifications hinted at in the image. In addition to Quandt’s leaks, a treasure trove of accessories were uncovered by Ishan Agarwal and Droid Shout late last week, including clear covers, leather covers, LED covers and more. Knowing how important these devices are for Samsung (and what they represent, with this being the tenth anniversary of the Galaxy S line), it’s no wonder that the company is developer such a wide range of accessories for the upcoming smartphone models. Finally, while it’s not directly related to these flagship phones, Droid Shout also notes that the wireless Galaxy Buds headphones will launch in three different colors (black, white, and yellow), while the Galaxy Watch Active will come in four colors (black, rose gold, green, and silver). Both should be unveiled on Wednesday. Reports of the headphone jack’s death are greatly exaggerated. Or more accurately, premature. All of the latest versions of Samsung’s Galaxy phones are equipped with a 3.5mm port, bucking the trend set by Apple and followed by Google. While the headphone jack might eventually die, right now, in 2019, it’s alive and could be a major selling point for the four versions of the Samsung Galaxy S10. Apple ditched the 3.5mm jack back in 2016 with the introduction of the iPhone 7, and some of us still haven’t gotten over it. The port has been around for generations. The 3.5mm audio jack is universal and handy, allowing someone to grab a set of headphones, any headphones costing between $10 and $1,000, and connect it to their phone. But alas, Apple removed the port from the iPhone and several manufacturers, including Google, followed. But not Samsung. While the rest of the industry turned its back on the 3.5mm jack, Samsung kept including it on its latest smartphones and started using it as an advertised feature. What was once standard to every phone became a selling point for Samsung. This isn’t the first time Samsung bucked trends and kept around legacy features to entice buyers. Smartphones used to have expandable memory, but as flash storage size increased, manufacturers stopped including MicroSD card slots on its phones. Not Samsung. Expandable memory remains an option in the S10 announced today. There’s a reason Samsung is the top smartphone maker in the world: It listens to its customers, and clearly its customers want the versatility of a 3.5mm headphone jack. I do. Alas, the 3.5mm jack will not live forever. Eventually the industry will move past the analog connection once there’s a better solution. But that’s not right now. Today, in 2019, the headphone jack has a friend in Samsung.